DGaO (Germany), Photonics Finland (Finland), SFO (France), IOP Optical Group (UK and Ireland), SSOM (Switzerland), SOS (Sweden), SIOF (Italy), HOS (Hungary), LOS (Latvia), and PhotonicsNL (The Netherlands). 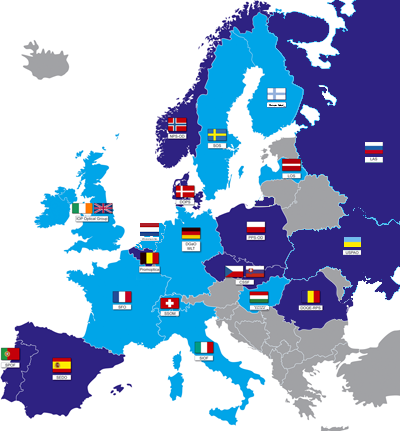 NPS-OD (Norway), DOPS (Denmark), Promoptica (Belgium), SEDOPTICA (Spain), SPOF (Portugal), PPS-OD (Poland), DOQE-RPS (Romania) and CSSF (Czech and Slovak Republic), WLT (Germany), LAS (Russia), and USPAO (Ukraine). Learned societies can join the EOS as a Branch or as an Affiliated Society. All individual members of the Branch automatically become individual EOS members with full benefits. IOP members are asked to fill in the membership form in order to activate their individual membership. All individual members of the Affiliated Society automatically become associate EOS members with limited benefits.